Oh my goodness, I don’t even know where to start with these two. 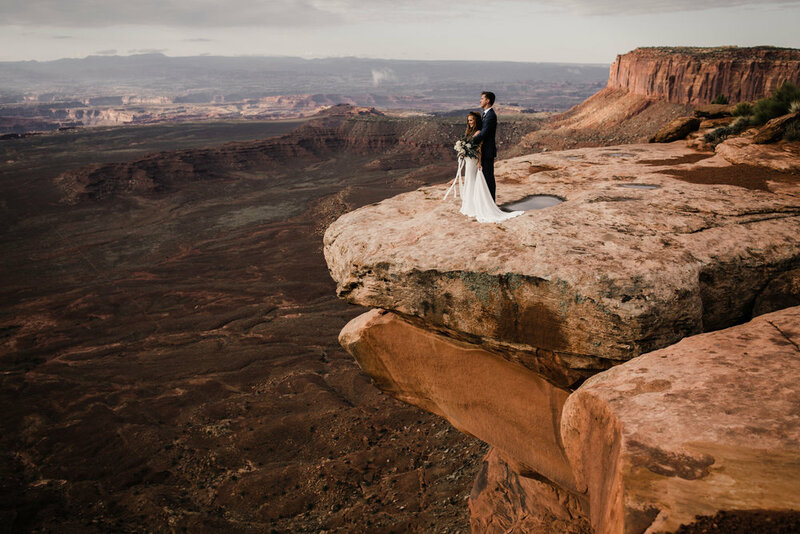 From the very first e-mail, Ben and Rachelle were full of enthusiasm planning their secret elopement in Moab. We always ask our couples a handful of questions to get to know them, and these two filled out their responses together with multiple paragraphs each. You could feel the energy from their words, and as soon as they described themselves as “basically Leslie Knope and Ben Wyatt” I knew we needed to work together. 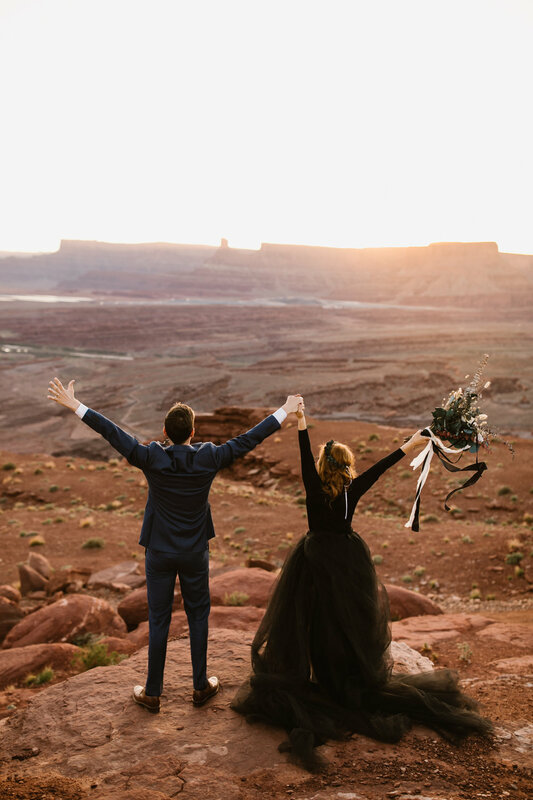 The description rang true with Rachelle’s perfectly-planned lists, millions of questions (that I loved answering) and, of course, the last-minute decision to get married in a dress that felt perfect to her, a gorgeous black skirt + sweater combo that looked insanely amazing in the Utah desert (total Leslie Knope move). 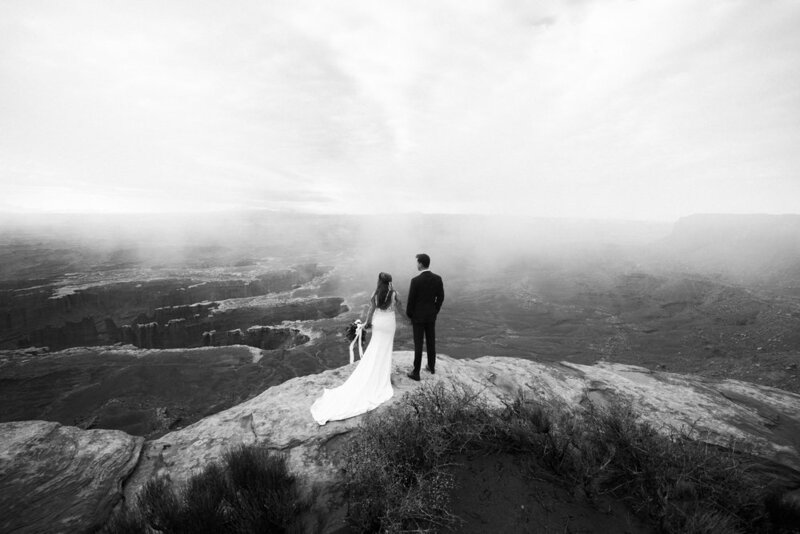 These days, most of our elopements are a different definition of the word - the couples’ families are in on the plan and sending their well wishes from home. This wasn’t the case with Ben and Rachelle, they managed to keep it a secret (mostly for the fun surprise aspect) and just invited a handful of close friends to join them. And I want to add, their parents were thrilled when they Facetimed them with the news the next day! One of our favorite things about planning their elopement was how open they were to our suggestions for locations. 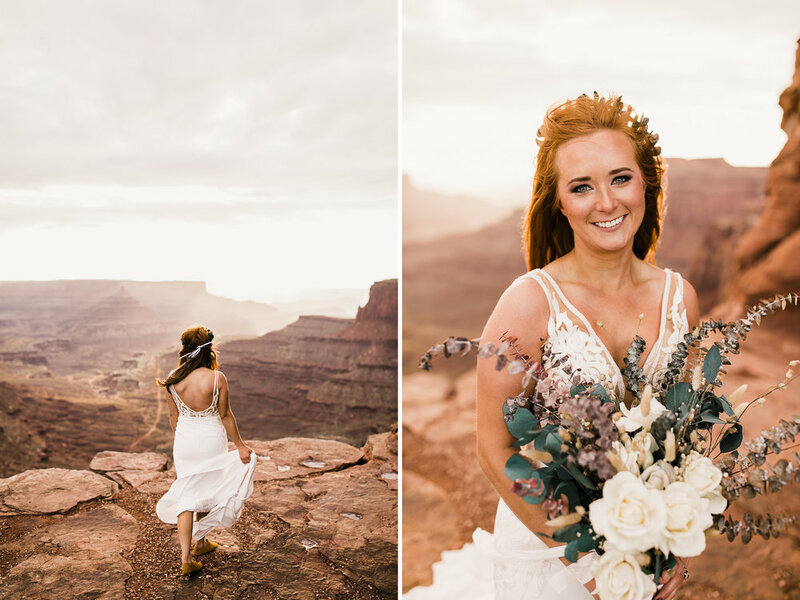 We decided to begin their day at sunrise and they wanted gorgeous views with a relatively easy approach, so we went out to Canyonlands National Park. The forecast was a little intimidating, but the rain held off and we were met with some of the most epic fog I’ve ever seen! The clouds gathered below us and poured over the neck of the mesa, and before we knew it they were completely gone. The conditions were absolutely gorgeous! After a break to explore Moab with their friends, nap (waking up for sunrise in Canyonlands is no joke! 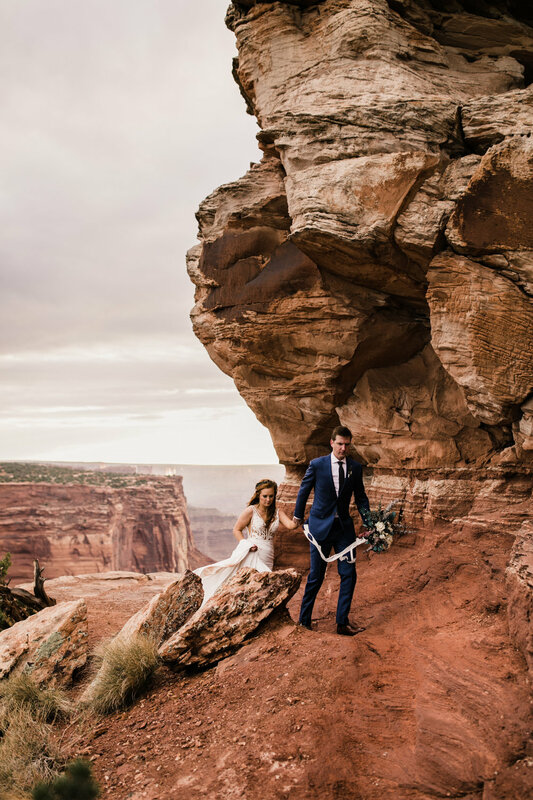 ), a refresh with the incredible Lesley Lind, and a dress change, they met us out in a secret canyon for their epic ceremony. They married on the edge of a cliff and then went up a little higher for some sunset portraits with the last bit of golden light. After a champagne celebration and embracing the long desert blue hour, we drove back down to the campsite where their friends had a fire going for some s’mores and more champagne. They ended the night around a little campfire, laughing and joking with their very closest friends. I’ll never forget, driving back down with them, hearing Ben remark “This was exactly what we wanted. It was better than we could have imagined.” And that is why we do this. All the planning, emails, answering questions — there is nothing like helping a couple create a wedding experience that leaves them feeling completely happy with the day. It was absolutely wonderful. 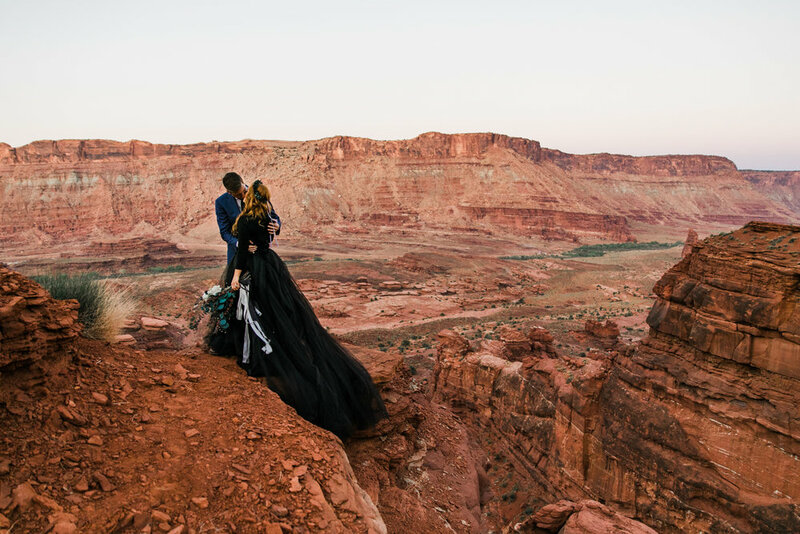 If you're considering eloping somewhere adventurous and you want to explore a new place, we highly reccomend the Utah desert. The options are literally limitless. We know of hundreds of gorgeous locations within an hour of Moab, Utah. 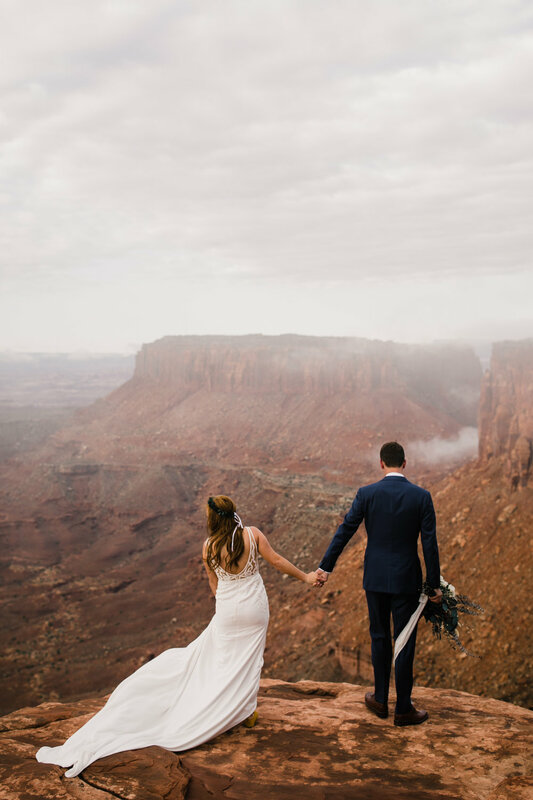 Moab is a great little desert town with all the amenities you could need including places to stay, grocery stores, gear suppliers, many restaurants and bars, and anything else you might need for your elopement or intimate wedding. 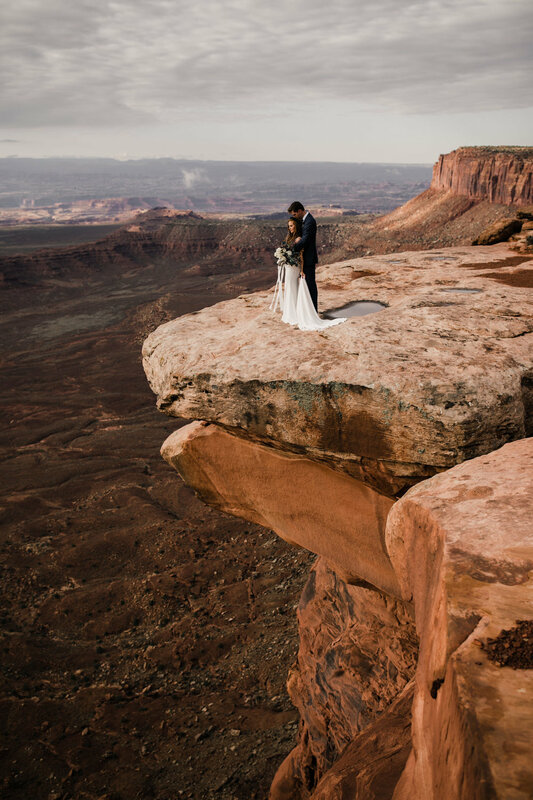 There are two National Parks nearby - Canyonlands National Park (pictured in this post, with the white dress) and Arches National Park (pictured here), as well as hundreds and hundreds of acres of BLM land (where they had their ceremony in this post).